Largemouth worked with LORD Corporation, already recognized as an industry leader in chemical adhesives, to create new conversations for the brand. Largemouth sought to showcase LORD as both an innovative technology leader and a thriving business with a positive company culture. The campaign tenets: make LORD Corporation’s story more meaningful (or relevant) to more people, create powerful and shareable storytelling assets, and engage media to showcase applications of LORD technology. To accomplish this, Largemouth sought to connect LORD with the mainstream frenzy of March Madness. We framed the narrative and deployed traditional and digital media strategies to shine a spotlight on LORD technologies working behind the scenes of The Big Dance. 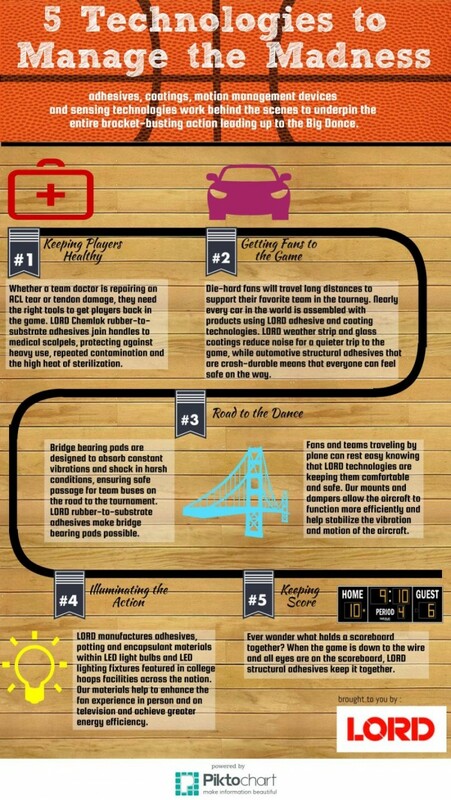 Largemouth created and leveraged an infographic to showcase LORD technologies in a new light. Largemouth launched internal and external programs, including a press release discussing “Five Technologies That Help Manage the Madness of College Basketball Tourney Season,” and digital communications for social media. An infographic was the centerpiece of the campaign. The interesting graphics and statistics highlighted brought LORD technologies to life, and the newsworthy tie to March Madness resonated with trade and local media. Largemouth leveraged LORD Corporation’s presence in Erie, PA, coordinating on-site interviews at a LORD facility to give local broadcast media could a first-hand look at the technology. Largemouth also focused heavily on design and manufacturing trade media pitching, leveraging the infographic to describe how LORD products were working behind the scenes to “Manage the Madness” of March. The campaign was a slam-dunk as the story spread and grabbed extensive play throughout local and trade media. Traditional and social channels were buzzing as hundreds of thousands of people were reached with key messages related to LORD Corporation’s industry leadership and national relevance. Social media conversations surrounding the “Managing the Madness” campaign reached an additional 95,000 followers.